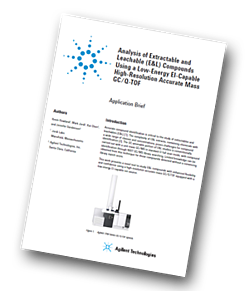 The GC-amenable portion of E&L studies is conventionally carried out with a unit mass GC/MS in standard EI full scan mode, with compound identification through NIST GC/MS library searching. Limited knowledge can be obtained from this technique for those compounds detected without a convincing library match score. This work presents a novel tool to study E&L compounds with enhanced flexibility and confidence using a high-resolution accurate mass GC/Q-TOF equipped with a low-energy EI capable ion source. The sample extracts and controls were analysed by an Agilent 7250 Series GC/Q-TOF system. An injection of n-alkanes was used to calibrate the retention index (RI) of the acquisition method. Compound identification started with Agilent MassHunter Unknowns Analysis B.08.00 using SureMass signal processing and matching against the NIST 14 GC/MS library. The formulas of identified compounds were studied by comparing the standard EI and low energy EI spectra. Agilent MassHunter Qualitative Analysis B.08.00 was used to review MS and MS/MS mass spectra when necessary. MPP software was used to perform the differential analysis between sample and control, with saline extract results shown as a representative data set. The results indicate that 113 compounds present in saline extract of the complete device with a fold change ≥3 and a p-value ≥0.05 compared to the control blank. The filter extracts were evaluated to study the impact of using different extraction solvents on the overall extractable profile. Low-energy EI increases the possibility of preserving or confirming M+, and accurate mass MS/MS spectra provide valuable insights into structure elucidation of unknown compounds. Accurate mass measurements and RI calibration can enhance confidence in compound identification. Differential analysis facilitates the comparison of E&L compounds among sample groups.